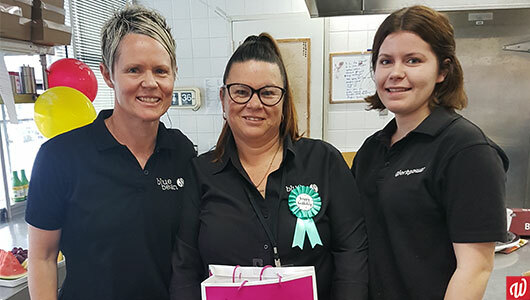 What an amazing 2018 for our little catering team! We take a closer look at the workplace and what team members do each day. In 2013 we started a cafe venture which grew into a successful catering business now based in East Perth. In addition, we manage the Blue Bean Cafe in the WA Police Headquarters. This unique arrangement of cafe and catering gives employees a range of experiences in the front and back of-house. Every morning we make fresh food for the cabinet, prepare lunch requests for the police staff, and manage catering orders for the day. As you can imagine it’s nonstop activity, but with a great team and relaxed environment we’re always having fun! You will work side-by-side with your Manager Julie and the rest of the experienced staff. The team keep things exciting and are always happy to lend a helping hand. Julie and the senior staff give training on correct food preparation techniques from day one, so you don’t need to worry about prior experience. Employees wash dishes and keep the kitchen and cafeteria clean and tidy. This includes peeling, cutting, and blending ingredients. You will help prepare the sauces, marinades, and salads used in all our food. Team members sort and package finished products for storage and delivery. Employees assist with service duties, which include receiving and delivering orders and communicating with customers. You can also learn to use the coffee machine. When you work with us at in catering, you get the best of both worlds. On one hand you develop your hospitality skills among experienced and supportive staff members in the kitchen. And on the other, you provide customer service and build lasting connections with the police staff. There’s plenty of opportunities here for career development. Are you keen to give us a try? Get in contact with us today to arrange a visit to any of our supported employment workplaces. Talk to Teresa here or on 1800 610 665! Articles in this series do not correlate directly to available employment positions, so get in touch with us for full details.